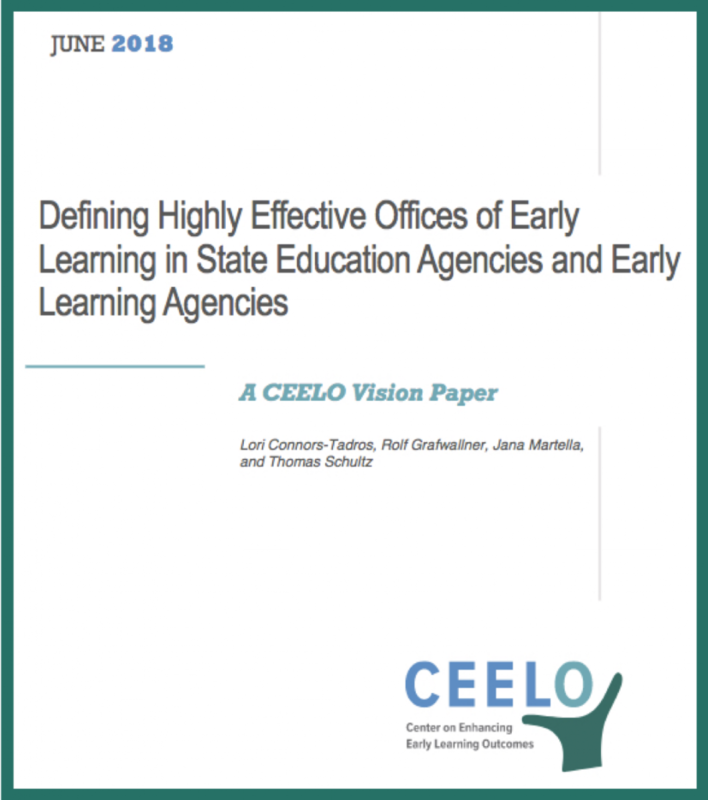 CEELO is committed to helping state early education policy makers strengthen their capacity to lead sustained improvement in early learning opportunities and outcomes for children. Our work is focused on nurturing strong leaders and highly capable staff who can guide state agencies to expand access to early education, enhance program quality, and obtain adequate funding to make a positive difference in the lives of children birth through third grade. State Capacity for Improvement – Defining Highly Effective Offices of Early Learning State level leadership and organizational capacity is essential to leading sustained improvements in early learning opportunities and outcomes. This session at an Ounce of Prevention convening highlights the CEELO Vision paper and discusses organizational capacity, effectiveness, and leadership and staff capabilities necessary for states to lead improvement in the long-term. Presenters explore strategies and opportunities for advocacy that focus on creating the organizational capacity necessary to advance the work. Below we provide resources, encouraging conversation and sharing TA opportunities to help policy makers and educators gain a deeper understanding of what it takes to be a highly effective office of early learning in state government. We invite you to engage and expand the discussion. OELs with organizational capacity have sustained leadership driving a coherent early childhood vision and strategic plan, bolstered by a capable team, well-managed infrastructure and external momentum generated by cross-agency collaboration, external funding and advocacy partners, as well as gubernatorial and legislative backing and funding. High-performing OELs have the organizational capacity to maximize opportunities to advance their vision and, over time, to achieve tangible improvements in funding, program and workforce quality, equal access, reductions in the achievement gaps and improvements in outcomes for children. To reach an ambitious vision for young children that drives toward outcomes, the OEL must align its many complex purposes and processes and direct them toward clear operational goals and objectives. These include incorporating research-based foundations of early learning, along with sound operations, systems implementation and performance management processes that drive toward evidence-based results. The OEL relies upon sustained and recognized leadership, management and early childhood expertise. Staff are well-trained in early childhood education and demonstrate in-depth experience as teachers and administrators in the range of early learning settings, content, and programs. They know, are known by, and are respected by, their state’s early childhood and public education communities. Highly effective OEL’s have strong leadership and sufficient staffing to develop and implement policies and programs designed to improve outcomes for young children. CEELO has a significant history addressing the leadership gap, starting with a development and implementation year for a Leadership Academy designed to address findings from a brief by Stacie Goffin, Building Capacity Through an Early Education Leadership Academy. You can examine the results of the first three years of the academy by reading, CEELO Leadership Academy: A Retrospective Review After Three Years of Implementation. Learn more about CEELO Leadership Academy by visiting this year’s Cohort 4 Leadership Academy. Expertise on curriculum, pedagogy, assessment, and technology. The OEL builds capacity of local early childhood agencies and elementary schools to help teachers improve their work with children. They help local administrators make informed decisions on curricula, assessment tools, materials and professional development including evaluating whether these resources are aligned to state standards and have adequate evidence of effectiveness. Continuous improvement in program quality, teaching and learning, and child outcomes. Over time the state can document progress in program, classroom, workforce quality, and compliance with standards, outcomes for children through ongoing data systems and periodic process and impact evaluations. OELs develop student and program standards, and promulgate regulations and policy to support implementation at the local level. Standards are internalized by front-line staff, which means teachers and administrators have a shared and concrete image of what high quality teaching and genuine family engagement looks like, along with progress for children on learning and developmental progressions. Periodic third party evaluations complement ongoing program monitoring and tracking of data on children and families. Search CEELO’s Resource Library for information and research on key early childhood content areas relevant to policy. Building State Capacity and Productivity (BSCP) Center – The Building State Capacity and Productivity Center (BSCP Center) is one of seven national content centers along with CEELO supported under the U.S. Department of Education’s Comprehensive Centers program. The BSCP Center focuses on providing assistance to state education agencies (SEAs) throughout the country to meet the daunting challenge of improving student performance with diminishing financial resources. The BSCP Center provides technical assistance to SEAs that builds their capacity to support local educational agencies (LEAs or districts) and schools, by providing high quality information, tools, and implementation support to help them shift from a “compliance-based” to a “performance-oriented” approach. The SEA of the Future: Building Agency Capacity for Evidence-Based Policymaking, The fifth volume of the SEA of the Future series was published by the Building State Capacity and Productivity Center (BSCP Center). The essays explore how state education agencies can bolster their ability to use research and data to drive key spending, policy, and program decisions. They draw on the experiences of agency staff from Massachusetts, Michigan, and Tennessee, as well as the work of the Regional Comprehensive Centers. Strategic Performance for Your Branch , by Sam Redding and Allison Layland, The publication is presented in three parts: 1) Introduction to Strategic Performance Management (SPM); 2) SPM in an Organization’s Division or Strand of Work; and, 3) Modules and Steps for a Division or Strand to Implement SPM Methods. SPM is a multistep process that can guide the leadership of a division or strand such as an office of early learning, in designing and revising a system of performance management. A division or strand can successfully engage in these processes to improve productivity and encourage innovation, even if the larger organization is not ready. A Framework for Choosing a State-Level Early Childhood Governance System , by Elliot Regenstein, Katherine Lipper, In the last decade, a number of states have made ambitious governance changes that involve creating new agencies focused on early childhood programs and services for children from birth to age four, or consolidating multiple early childhood programs into the same agency. These governance structures can offer multiple benefits, but states that have been through the process have emphasized that the transition is not easy.